TurnClick makes it easy to modify text and images on any website, and show those modifications to a particular visitor or a group of visitors. Click here to learn about common uses for TurnClick. 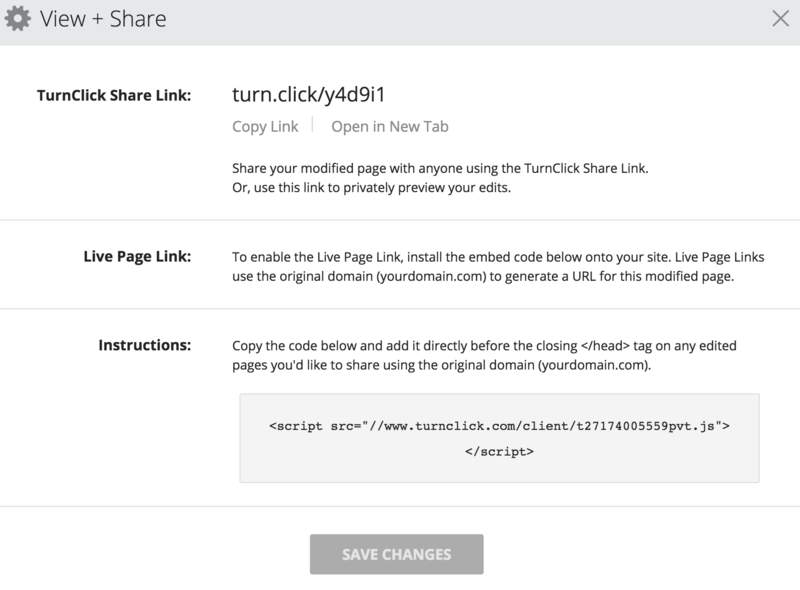 Enter a URL in the main form field at www.turnclick.com, or if you are a registered user, log into your account and use the field at the top of the dashboard view of your account, then click the “Modify Page” button to begin. The TurnClick Canvas is the page that will load after you enter a URL and click “Modify Page”. The Canvas is where you will make all your edits and adjustments to the pages you want to modify and personalize. Once your page is fully loaded in the Canvas, you’ll be able to select any element with your mouse. You’ll immediately notice a blue border highlighting each element you hover over. This indicates that this is an element available for you to select and edit. When you click on an element, the border will turn red, indicating that you have selected and are now able to edit that particular element. When you select a text element, you’ll notice an editor panel appear at the bottom of your screen. This editor window includes the text you selected and allows you to modify the original content. You’ll see basic options to bold, italicize, hyperlink, and view the source code for the text element you are editing. Most often, you will simply highlight the text you want to change and begin typing your changes. You’ll see your edits show up in real-time on the Canvas. Once you are happy with your edit, click the “Save” button in the upper right corner of the edit panel to exit the editor and go back into the Canvas experience. When you select an image element, you’ll be presented with a popup window that will ask you to upload an image or to remove the one you selected. You can drag an image from your computer right into the popup window, or you can click the link to select an image using your computer’s file system. 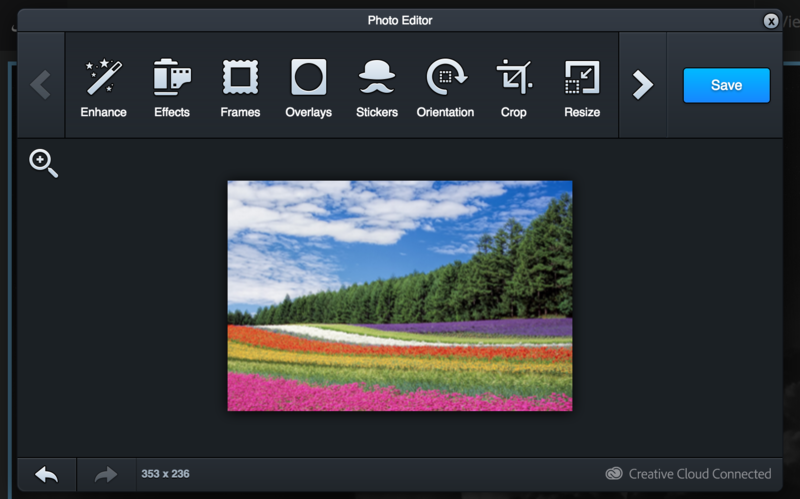 After selecting and uploading your replacement image, you’ll be placed in the image editor experience. In the bottom left corner of the editor, you’ll see the dimensions of the new image you are editing. This is a handy reference for getting your new image to be relatively close in size to the image you are replacing. It’s best practice to use the same size image as the one being replaced, and the imaged editor allows you to resize and crop to make this happen, but it’s not a requirement with TurnClick. You can edit your image using all of the editing tools available: cropping, highlighting, rotating, and adjusting colors. When you are ready, click “Save” in the upper right corner of the editor and you’ll see your new image show up in place of the one you originally selected. An alternative to replacing an image is to simply remove the original image. When you select an image element, in the popup window that asks you to upload a new image, you’ll also see a button to “Remove Image”. If you click that instead of uploading a new image, the editor will remove the original image. After you have saved a modification to any element on the page, you will notice a permanent blue border will remain on the edited element. This will help you identify which elements have been previously edited on the page, in case you want to go back and reselect and edit them again or restore them to their original state. You can find a list of all the edits you previously made in the “View Edits” dropdown menu in the toolbar at the top of your screen in the Canvas. If you select a previously edited element through this menu, you will navigate to the position of that element on the page and the editor panel will open to show you what has been modified and let you continue making edits on that element or restore it to the original state. To restore the original content of any edited element, you can simply click the blue highlighted element to open the editor or use the “View Edits” dropdown to select the element you want to restore. 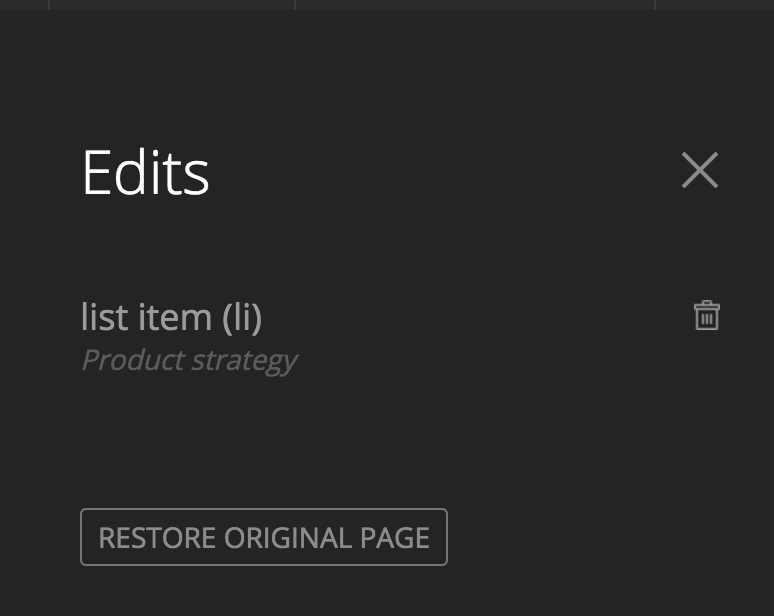 In the editor panel that slides up, you will see a button labeled “Restore Original”. If you click this button, the text or image edit you made will be removed and the original content will be restored. The restored content will no longer show as a previously edited element in the Canvas and the blue border will disappear. It is also possible to restore all elements associated with a page you are editing by clicking the “View Edits” link in the toolbar, and within the dropdown menu, click the “Restore Original” button which will restore all edited elements at once, returning your page to a clean slate with no edits. In the toolbar, you’ll notice a toggle between “Edit” and “Navigate”. By default, the Canvas is always in edit mode. If you want to navigate to another page to modify as part of your editing session, you can switch to “Navigate” mode and begin clicking links to navigate away from the original page you loaded in the Canvas. To learn more about navigation and its uses, read the article here. At any point in your editing experience inside the Canvas, you can simply click the TurnClick logo in the upper left corner of the toolbar in the Canvas to navigate to the main dashboard. To learn more about the features and uses of the dashboard, click here. TurnClick makes it easy to view and share your edits using the View + Share button. After clicking "View + Share" you&apos;ll be presented with a window that lets you copy and open a TurnClick Share Link or a Live Page Link. In order to take advantage of the Live Page Link feature, you&apos;ll need to register for an account and install the Embed Code on your website.